Continual investment and extensive research has resulted in the development of the most consistently accurate .22 cartridge in the world. Tenex has been developed to give you the confidence to achieve outstanding results. Extensive testing and medal winning performances confirm that this unique product consistently delivers greater precision – raising performance standards for all .22 calibre shooters at all levels of competitions, setting the benchmark. Tenex incorporates a series of major breakthroughs in production technology, resulting from an extensive programme of research and development. It represents ELEY’s continuing investment and on-going commitment to leading the way in the sporting ammunition market. 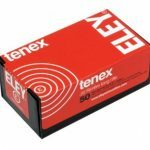 For over 50 years, Tenex has remained at the forefront of international shooting, as the world leader in consistency, it has regularly been the choice of champions setting record after record at the Olympic Games, World Cups and national shooting competitions. 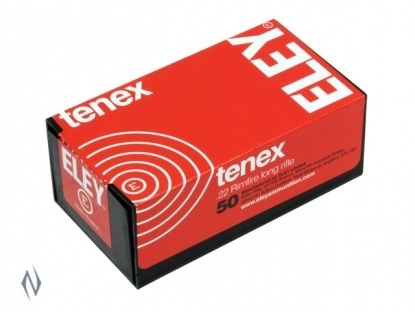 Tenex has a revolutionary bullet shape proven to give optimum performance. Computer controlled visual inspection of each individual bullet and a rigid system of statistical process controls ensures that consistent standards are maintained at every stage of production. Its temperature controlled lubrication system ensures totally consistent chambering and barrel protection. Extensive testing of production samples in our sophisticated test range measures actual performance to an advanced level of accuracy – setting new standards in performance measurements. Only after it has passed an extensive series of quality checks do we approve the cartridge for release with the Tenex name. Such premier quality cartridges should be dispensed from high quality packaging. Following major investments and consultation with a number of shooters, ELEY has developed a new modern much improved ammunition box, with draw mechanism aiding the discharge of cartridges.